There are SO MANY amazing and new things happening at Calvary! The Spirit of God is surely moving and the Tri-Town YMCA summer camp has officially kicked off their summer program at Calvary! I love coming to church and seeing a bunch of little smiling faces playing soccer in the grass, creating works of art in the Parish Hall or helping tend the garden as they water our now shared vegetable garden that helps provide fresh produce to our local food pantry. The Tri-Town community has now officially moved their offices in! So let’s do our best to show them what Christ’s love and radical welcome for all looks like. For the last year many from Calvary have been praying that we get on the map, and people begin to know where Calvary is located. Now with the Tri-Town YMCA sharing our space we have LOTS of amazing people from the community frequent our doors! God is good! If that was not awesome enough we have a new secretary Anna, who is eager to serve, kindhearted, tech savvy and reminds me of all the things I forget! Who could ask for anything more! God truly does provide! I am also pleased to announce that we have a new Music Director, Jason Hill! Please give him a warm welcome, as he will officially begin July 8th! Jason is a graduate of Garrett-Evangelical Theological Seminary at Northwestern University. He served as a United States Marine for many years, has a passion for discipleship through the worship arts, a heart for pastoral care, strong administrative skills and he leads a puppet ministry that helps tie communities and churches together! A huge thank you to our Music Committee, Audrey Shuurmann, Bill Kendall, Jan Bruesch and Don Bradley who prayed with me and helped discern which candidate God was calling to our community. They did an amazing job! 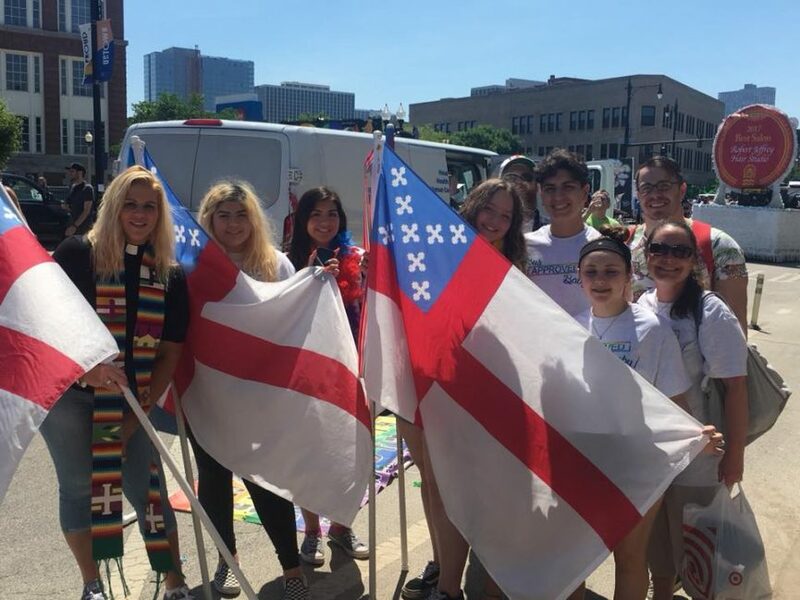 Donald Castle and I also had an amazing time with our teen youth group as we ventured to Great America and walked with the Chicago Diocese in this year’s Pride Parade. The kids had a great time navigating the city and finding God in the most unexpected places. We are so proud of our children as they continue to deepen their relationship with God and one another. We look forward to what the rest of the year may bring! Thank you for your love, support, service and prayers as we continue to discern how God is calling us to serve and love everyone in our community!